Q: How many types of Cylons are there? 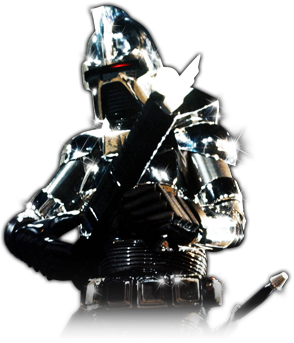 A: In Classic Battlestar Glactica (BSG) there are five types of Cylons. Civilians, Centurions (Chome), Command Centurions (Gold), I.L. Series and the Imperious Leader. Q: Are there "Bronze" Cylon Centurions? A: Yes and No. Yes, due to the effects of age on surviving screen used costumes and differences in lighting during filming. No, due to the fact there is no clear "mid range" Centurion character in the series. Centurions were either followers (chrome) or leaders (gold commanders). Finally, there were only chrome and gold toys/merchandise produced... no bronze. Q: Is the Imperious Leader a robot or a lizard? A: The Imperious Leader is a robot. He is the most calculating, conniving and underhanded of the I.L. Series Cylons. He has an organic shell that is a faithful recreation of the original Reptilian Cylons that were destroyed by the robots they created. The appearance of the Imperious Leader is a twisted homage to their creators whom they betrayed and murdered. Q: Do any of the Cylon costumes have "Found Items" in them? A: The Centurion and Civilian do, yes. The Centurion: Hockey Gloves, Boots, Camera man battery belt. The Civilian: All the greebles on its face. Q: What is the vision like when wearing a Centurion helmet? A: What vision? (ha) Vision is very poor. Typically a wearer sees out of small "salt and pepper" holes in the brow area, or a narrow slit over the red electronic eye. When trooping as a Centurion, it is a good idea to take small steps, have a helper and if you can avoid stairs.